Hi, my name is Carrie Johnson (pleased to meet you)! The Pawed dream has been around for more years than I am willing to admit, but I am so excited to finally see things start to happen. I’ve had many crazy ideas about which direction to go in over that time, but for one reason or another it wasn’t the right time/never worked out. Then last year (2012) things started to get serious, well… people stopped laughing at my ‘ridiculous’ musings and I managed to convince a few that ‘no, I’m not having a laugh’ (well, they seemed convinced to my face at least … and I’ll take that). There’s some other icky nonsense about being made redundant etc in there too, but the point is with a nudge and a push I started to think that this could really happen. Anyway, what I am saying is that I could tell you a million (hundred?) hundred things about each one of my dogs and each one would be relating to something they had done, how they behaved or what they ‘meant’ when they did this or that. It’s not because I baby my dogs (I do), nor is it because I believe they actually are babies (they are; furry ones) it’s because they all have their own personalities. I know!! … Groundbreaking. So, when I am looking for something to buy my furry ones I’m quite often dismayed. Even by something as readily available as collars, yeah it’s easy to track down any old thing for any old dog… but! just because Myfie is a Westie (i.e. he’s Scottish) does not mean I want to put him in a tartan collar**, nor does it mean he wants to wear it! No, Myfie is badass! He wants something that says who he is when strangers see him on his walk … he wants to wear a little bit of his personality on the outside, just like we do! So, in the coming months we will be bringing you a selection of fabric collars and accessories that make a statement about who your best furry friend is. Many of us like to dress our dogs up from time to time, but the humble collar has been ignored too long! Seriously, have you ever asked your dog if they like their collar? Your dog has to wear one, and we’re confident one of our collars will make him or her proud to be wearing it. What’s more they will all be designed and handmade, by us, in the UK. It’s important to us that each piece is made with love, care and above all else; ethically. Over the coming weeks, we hope to get to know some of you a lot better, share a little bit of our progress and have those tails wagging in anticipation! I’ll also be sharing stories and updates from my three four-pawed business partners (and about them, when they aren’t looking). I welcome comments and suggestions, and would love to hear about your own furry best friends too! *I’m sure if they did scientific research on that, it would be an actual fact! ** There’s nothing wrong with Tartan, in fact it’s quite nice … you know what I meant, right? So Carrie, you decided to join the small clan of Uncle Spike followers, sometimes known as The Spikey’s…. That makes me a happy blogger now – I really appreciate you making that special mouse click. I’ve been meaning to tell you. I love Millie but I am becoming obsessed with a dream about having a white Scotty someday like Myfie or Ellie. I know they are Westies but is that the same as a Scottish Terrier? I love my Goldens and hate imagining a life without them but in 10 years or so when I am close to retirement I want just one little dog to shower all my love on. One Westie can’t shed as much a five Golden retrievers right? Aww! Well I may be a little biased, but I think a Westie or a Scottie would be a perfect choice! It was only recently that I discovered you can get White Scotties, but you can and they ARE different. I am not sure what those differences are in character, but if you look at pictures I think the most noticeable thing is that a Scotties snout is that little bit longer. Their faces seem more structured. but either way, both are fun loving, little balls of Scottish love! Melissa! Thank you so much, that is really so lovely of you. I have never received an award before and am so totally chuffed. Especially as it comes from you! 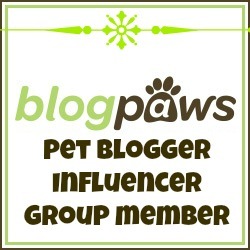 Since you were one of the very first people to welcome me over at Blogpaws! Hello Carrie pleased to meet you too!! LOL I know we have been connected for a few months but I had not really had a chance to sit down & read your blog or ABOUT YOU! So this is my official “HALLO” to you from Nylablue & I….. I have never seen a *white* Scottish terrier….now that would be something! Thank you for the official hello! Haha you are already doing so much better than me, I constantly feel behind with this thing. i don’t actually know how many blogs I am following 😀 and think I am better off not looking… for my sanity! eek. I try not to count how many blogs I follow too Carrie!!! I try to accept all new people following us…I do not want to leave anyone out. this year we have 6-8 new people (like yourself) following us. It is lovely & I do enjoy reading blogs & sharing my Life with people all over the world. I am very interested in that black & white blog…please let me know the name so I can go visit them. Me too! I’d hate to think of leaving folks out. It all seems pretty new to me, I started this blog in 2012 but only wrote a few posts and didn’t really know what I was doing or where I was going with it. The in November of ’13 I got back into the swing of things so pretty much EVERYBODY is new! Maybe I shouldn’t be so hard on myself and my time-management! This is the blog with the two adorable scotties: http://scottiemom.com/ be careful, you’ll fall in love! We are very alike! I like to let people know I appreciate them taking time to read our blog. I joined here August of 2012 after Multiply (previously Yahoo 360) closed the blogging part of the site…I started with 5 friends who came from there to here & the rest is history….i wandered around & just experimented with things. I am not a pro by any means but I can navigate the site well now. I am going to check out the blog link…wish me luck…bet I add them…lol..